A new multi-university center led by Texas A&M University will contribute to our understanding of materials science fundamental to the maintenance of the United States' nuclear deterrent. It will also train the next generation of scientists and engineers who will ensure the safety, security and effectiveness of the nuclear weapons stockpile. The Center for Research Excellence on Dynamically Deformed Solids (CREDDS) will receive $12.5 million over five years from the Department of Energy through the National Nuclear Security Administration (NNSA). The NNSA is the agency behind the Nation's Stockpile Stewardship Mission (SSM), which works to guarantee that our nuclear weapons are reliable without testing them (per the U.S. policy to abide by the Comprehensive Nuclear Test Ban Treaty, which is not yet legally in force). 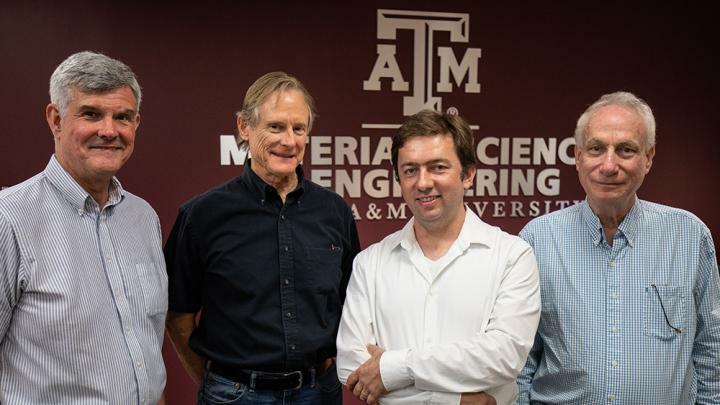 "We are honored to be selected as a new NNSA center," said Dr. Michael J. Demkowicz, an associate professor in the Texas A&M Department of Materials Science and Engineering and director of CREDDS. "In addition to CREDDS' support of the SSM and training of future scientists, I am excited about the new science that will come out of it." Research from other facilities created as a result of stockpile stewardship has led, for example, to an improved understanding of how supernovas happen and insights into the fundamental properties of matter. In addition to Texas A&M, other universities involved in CREDDS are the University of Michigan, the University of California at Santa Barbara and the University of Connecticut. Principal investigators for those universities are, respectively, Professor A. Misra, chair of the Department of Materials Science and Engineering; Professor I. J. Beyerlein and Assistant Professor A. M. Dongare. The nation's last nuclear test was in 1992 and the weapons in our stockpile are aging. Changes over time like radiation damage to some materials and even corrosion mean that "the weapons must occasionally be refurbished," said Dr. Marvin L. Adams, the HTRI Professor in the Texas A&M Department of Nuclear Engineering and associate director of the Institute for National Security and Cybersecurity Education and Research. But that maintenance can entail the introduction of new materials and processes. That's because some of the old manufacturing processes used to produce the original parts of a weapon no longer exist. Plus, some of the materials used in the past can't be used now because of environmental safety and health implications. As a result, scientists and engineers are exploring advanced manufacturing processes like 3D printing as well as new materials. But how do you ensure that those replacements will work if you cannot test the final weapon? Enter supercomputer simulations of how the new parts and materials will perform under the conditions of a nuclear explosion. Those simulations, however, must be informed by a thorough understanding of the fundamental science involved. "That's a big part of what gives us confidence that these weapons will work. And that thorough understanding is what the stockpile stewardship program has given us and continues to give us," said Adams. CREDDS focuses on the science of the metallic materials behind our nuclear weapons. For example, it will explore new materials produced by advanced manufacturing processes. These materials, which can have properties superior to their predecessors, have complex microstructures that challenge conventional knowledge of how materials deform, or change, under the conditions associated with nuclear reactions. Of special interest to CREDDS researchers is how the materials deform under very high strain rates, or how quickly the shape of a material changes under extreme conditions. In nuclear reactions this is very, very fast. Think billionths of a second. Among other challenges, CREDDS researchers aim to observe what happens on the level of individual imperfections in a metal when the metal is exposed to high strain rates. They will not only examine the material afterwards–a kind of post-mortem analysis–but also see what's happening during the deformation. "So this center is going to be all about high-speed cameras, acquiring lots of data very very quickly, and developing new tools that allow us to look at the individual features of a material," Demkowicz said. To that end, CREDDS will include a variety of outreach activities that include seminars and a summer school planned for the fourth year of the project. In addition, undergraduates, graduate students and postdoctoral associates affiliated with CREDDS will have the opportunity to visit and spend extended periods of time at the national laboratories involved in stockpile stewardship. Ross said that Texas A&M is the perfect home for the new center. "Given the strength of our engineering program–top ranked, not just in the country but in the world–it's the right place to do this kind of work. I'm not surprised that NNSA chose Texas A&M to take the lead on this."